I really hope you will join us for this special event on Sunday, January 11, 2015! 5 Key Decisions That Helped Us: Jenn and I will be sharing 5 key decisions that helped us win with money. We both believe that these decisions transformed our finances and our marriage. 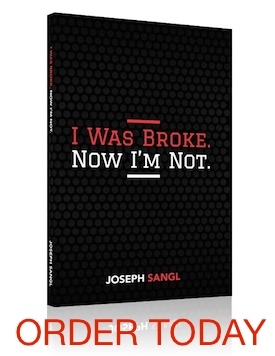 OFFICIAL BOOK RELEASE: We’re CELEBRATING the official release of my newly revised I Was Broke. Now I’m Not. My team is putting the finishing touches on it right now, but I promise it will help you on your money journey. Encouragement for your Money Journey: Jenn and I want to provide encouragement for you. We’ll be sharing parts of our story and also practical “next steps” you can use to win with your money! One more thing: You don’t have to wait until the official release date, January 11th, to order the NEW I Was Broke. Now I’m Not. Book. Pre-order your copy right now by clicking on this link HERE and receive special bonuses!